I was 18 or 19 when my father, a musician his entire life, called me up with a very excited tone of voice; he had just learned that a guitarist from his old Bayonne tavern gigging days was performing regularly in the Village, and we had to go, because I'd love him. Now, my dad was the same guy who would call me up at my college dorm to play Steely Dan's "Reelin in the years" guitar solo to me over the phone because it came on the radio at work... the kind of enthusiasm you love and appreciate, but with an eye roll after a while. According to my father, this guy was the closest thing to Hendrix he had ever seen, and although I was skeptical, figured what the hell, I could squeeze a few under-aged drinks out of the night at the very least, so we picked a Friday and headed over to Terra Blues on Bleecker street. Michael "Murch" Murchison, later playing under the name Michael Powers, was born and raised in Bayonne, New Jersey, the same town my father and I grew up in. 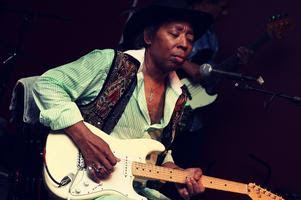 With a diverse local music scene in the '60s and a military base next door, it was a melting pot, where Murch would trade albums with sailors from Liverpool, listen to everything from Motown and Stax to the British invasion, and even learned his first "A" barre chord from none other than bluesman Jimmy Reed while working at his dad's restaurant. He took lessons at Piero's Music, just as my father and I did, and spent his summers in North Carolina on his family's tobacco farm, learning firsthand lessons about the blues and segregation in the Jim Crow south. As a teenage guitar prodigy, Murch would open for James Cotton, Muddy Water's longtime harmonica man, and then be hired to tour with him while still in high school. It was this perfect storm of influences that lead to a unique sound, as my father witnessed in the early 70s while Murch performed with Red, White, & Black, his local group at the time. This was Curtis Mayfield meets Jimi Hendrix, with blues roots stemming from the Delta upriver to Chicago with a detour through those Carolina tobacco fields and front porches... Murch could have been Jimi's heir apparent, with a much smoother, soulful voice, if I may be so bold. His next group, Moonbeam, gigged nightly from 1975 to 1988, before Murch began his near-30-year residency at Terra Blues, first as the Chelsea Blues Band, then as Michael Powers Powder Keg Band (as I was introduced to him). After grabbing a few slices of pizza, my dad and I headed down Bleecker street to Terra Blues, where I ordered a Jack'n'Coke in my deepest 18-year-old voice (hope my old man tipped them well). A few minutes later, I saw an unassuming middle-aged man walk out on stage with the help of a crutch, wearing some Vietnam-era olive drab fatigues, and my dad, in his giddiest tone, exclaimed, "That's him! That's Murch!". Murch had lost a leg due to diabetes, but didn't let it slow him down one bit. He picked up his Strat, tuned up quickly, hit one note thru some type of UniVibe-style effect, and that was it... I looked at my dad with a giant smile, the hair on my neck standing on end... this was the closest to Band of Gypsys I would ever get (Murch even attended one of their legendary Fillmore East shows in 1969. I later discovered). Michael Powers and his Power Keg Band would spit fire and soul for two sets, including a cover of Jimi's Little Wing, and my dad ran up to him in between, re-introduced himself as a fellow veteran of the Bayonne music scene, and received a warm, friendly smile and hug. A few Jack'n'Cokes later, we left smiling and fulfilled. 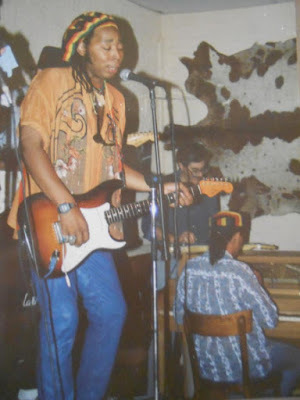 It's still one of my favorite memories of time spent with my dad, and furthered my love of the blues..
After the 9/11 attacks, Murch took a short break from Terra Blues, toured Europe, and began a prolific period of recording over the next few years, with albums like Onyx Root, Prodigal Son, and Bluesiana Breeze capturing some incredible songwriting and performances from Murch, and his newest band, Michael Powers Frequency, who are back at Terra Blues regularly and have a new album called Revolutionary Boogie. Check out Murch and the band every Monday and Friday night on the Terra Blues calendar, you won't be disappointed! You can also find Murch on Facebook and Twitter to keep up with him. I remember Murch from Red White and Black. And I once got them a gig playing for a fraternity on a boat. I am from Bayonne also. I had the pleasure to gig with Michael several times during the "Red White & Black" 25th reunion. His masterful use of blues notes took my breath away, as we rehearsed for that reunion. Clearly, those who are most talented are overlooke; in an industry where having a gimmick is more important than musicianship. Michael's unique talents are important to the music industry and to the future of the blues. As every country should have their own military to keep their country safe, so that there is a military bases in north carolina which so strong to save their country from unexpected events.